Gir National Park is widely popular for being a home to wild creatures. Home to wide range of animals and plants, the vegetation of this park is rich because of presence of various factors such as perennial rivers that flow through this area. Rich biodiversity of this area makes it an ideal spot for scientific study for biologists from different parts of the world. The major attraction of this national park is Asiatic Lion. If you’re visiting this destination for the first time, then you would have to research about accommodation. The better idea would be to get in touch with Travel Hot, as it can help you holiday packages with ease. Once you start availing their services, you’d never have to worry about accommodation in Gir on your future trips. 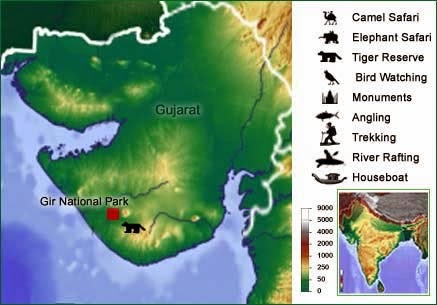 The Asiatic Lion: Sasan Gir is only place in the world outside the African continent where Asiatic Lions can be found in their natural habitat. They are one of the prime reasons why large number of visitors travel from different parts of this world to this national park. You should avoid visiting this destination during afternoon hours because during this time most animals prefer resting in shade. Check out Gir safari timings in order plan in advance.